Be the firsts to hear about new Caterpillar Products. The event Malaga Electric Power Days organized by Caterpillar, is a unique opportunity for you to discover the full extent of CAT® products. Discover the new generator C175 – 20 – of a power up to 4 MW with low emission of greenhouse gases. Extend the warranty of your emergency generators up to 5 years. Wherever you are, we have solutions for you. There is also a hybrid CAT technology to reduce operating costs through the use of renewable resources. Each production unit is adjusted for your exact needs qualified technicians or by contracting with Eneria. If you need instant power, we can offer a mobile solution generators. Are you carrying a project? Meet the experts Caterpillar in Malaga and get the best advice and solutions to meet your needs. 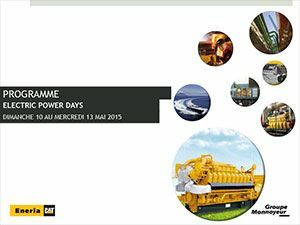 Share the post "CAT Electric Power Days – Malaga May 10-13 2015"